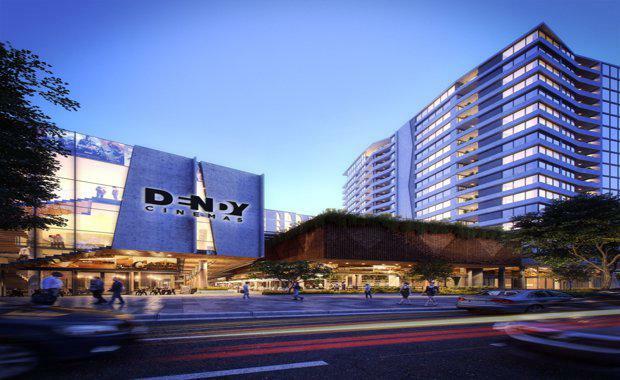 Boutique national cinema chain Dendy Cinemas has signed up as the operator of a 10-theatre complex within the $232 million Coorparoo Square in Brisbane’s inner southeast. The operator has committed to a 15-year lease at Coorparoo Square, a joint venture between leading developers Australand and Honeycombes Property Group. Dendy Cinemas is the first tenant to join the retail line-up at Coorparoo Square, which is set to rise on the iconic Myer site and comprise more than 360 apartments and over 6000sqm of retail space. The project will involve the transformation of the currently vacant building into a vibrant urban centre comprising three residential buildings, restaurants, cafés and the cinema precinct. The new Dendy Cinema complex, the company’s second in Brisbane, will include seven standard screens and three Dendy Premium Lounge screens which feature fully reclining luxury leather seating and a pre-screening premium dining and bar lounge. Dendy/Icon Group CEO Greg Hughes said the company was keen to be part of the Coorparoo Square offering given its status as a landmark development for Brisbane’s inner southeastern suburbs. “As a suburb that continues to experience residential growth and serves as an existing entertainment hub for the surrounding areas, Coorparoo was a natural choice for us to complement the Dendy Portside cinemas at Hamilton,” he said. “This, coupled with the exciting development plans for the area, ensured the location is a strong fit for the quality entertainment experience that is the Dendy brand. "Australand General Manager Residential Queensland, Cameron Leggatt said the joint-venture partners were thrilled to be delivering a high quality theatre experience as part of the Coorparoo Square development. “It will enhance the lifestyle of not only Coorparoo Square’s residents but also the entire Coorparoo community,” he said. Honeycombes Property Group Managing Director Peter Honeycombe said securing Dendy Cinemas was a significant milestone in establishing Coorparoo Square as a vibrant lifestyle precinct. “A cinema complex is the cornerstone to any such precinct and as the first retail tenancy to be locked in, Dendy Cinemas has already been instrumental in attracting other quality tenants to join,” he said. Development Approval for Coorparoo Square was granted in October 2014 and subsequently, national building company Probuild has been announced as the construction contractor, paving the way for demolition of the iconic Myer building this month. As well as residential and retail elements, Coorparoo Square will include more than 660 car spaces and residents only access to a tennis court, two large swimming pools, large recreation areas and green space.The residential offering will include a mix of one, two and three-bedroom apartments as well as luxury penthouses.